While many come to Jackson Hole for the amazing skiing, even if you don’t ski, there is plenty to do. National Elk Refuge There’s still time to see up to 7,000 elk all in one place! The National Elk Refuge is a valley where elk naturally migrate for the winter. As the weather gets warmer in April and May, the elk will head up higher. Make your reservation for a sleigh ride for the best view of the herds. National Museum of Wildlife Art Once you’ve seen the elk at the Refuge, stop by the National Museum of Wildlife Art just up on the hill for an extensive display of wildlife art from around the world. The architecture of the Museum itself is amazing and you can look out over the valley and see the elk and other wildlife. Granite Hot Springs Imagine a van picking you up right at your hotel, outfitting you for a snowmobile ride and then just a few miles later, taking a dip in the beautiful outdoors at Granite Hot Springs. Togwotee Snowmobile Adventures will get you there! Hootenanny at the Spur Bar The name just sounds so fun, we had to include it on the list! Monday nights at 6:00pm, the Spur Bar, located at the Dornan’s Resort by Teton Village, hosts the best live music. Come early, eat at the Pizza and Pasta Co. and stay for the music. Jackson Hole Buffalo Meat Company Stop by for ranch-raised buffalo and elk jerky and pick up a gift package to take home. Or create an order and they’ll be happy to ship their legendary buffalo, elk, wild boar or trout to you when you get back home. Free Bouldering Park Here is something for the entire family. At the base of Snow King Mountain, you’ll find the Bouldering Park which is free and open year round. It features boulders/walls for all ages and skills. Year-round Stargazing (on clear nights of course) Wyoming Stargazing offers public stargazing events every Friday night on the lawn next to the Center for the Arts. The program is from 8:30-10:30pm from October-April and 9:30-11:30pm May-September. StillWest Brewery & Grill At the base of Snow King Mountain, StillWest is one of the newest breweries in town and has quickly become a local and visitor favorite. They craft their ales and lagers on a 10-barrel brewhouse with seven fermentation tanks and 10 serving tanks. Visit their tasting room above Brewhouse Coffee. Visit an Art Gallery Jackson, WY has become known as “The Art Center of the Rockies” where you can find that one-of-a-kind piece to add to you collection. Visit the Jackson Hole Gallery Association website for list of galleries. Shopping for Jewelry in Jackson Looking for something special to take home for yourself or a loved one? Whether it’s silver, turquoise, gold or something in leather, Jackson is home to an amazing list of world-renowned jewelers and artists. 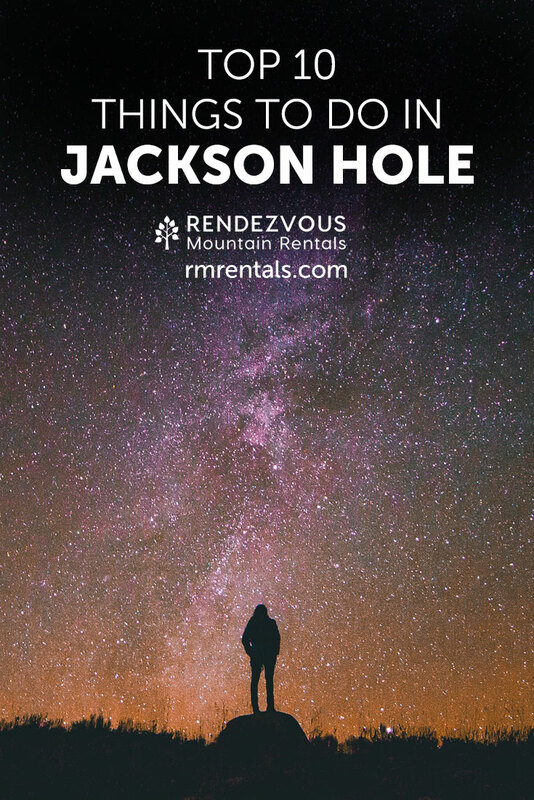 Come visit Jackson Hole and get busy on this list of things to do!